1. Why is good nutrition so important? Good nutrition, in other words eating healthily is a key component of a healthy lifestyle. Healthy eating and physical activity can help one to achieve and maintain a healthy weight, reduce the risk of non-communicable diseases like diabetes, high blood pressure, heart disease and cancer. The risk starts in childhood and builds up throughout life. The concept of optimising nutrition in the first 1,000 days (the period from conception to the first two years of life) is important for the prevention of over- and under-nutrition. Therefore, good nutrition promotes overall health. 2. What does it mean to be overweight or obese? 30.0 or higher, it means you are obese. A child 0 – 5 years whose weight-for-length/height as indicated on the Road-to-Health Booklet is above 2 standard deviations is overweight. If the weight-for-length/height is above 3 standard deviation, the child is obese. A child 5 – 19 years whose BMI-for-age is above 1 standard deviation is overweight and if the weight-for-age is above 2 standard deviations, the child is obese. 3. What is meant with the term ‘breakfast’? Breakfast is the first meal after the longest period of sleep and it is consumed within the first 3 hours of waking. It consists of a food from at least one food group excluding a beverage such as coffee or tea only. Breakfast may be consumed at any location other than home, for instance at school, at work, at a restaurant or while travelling. Breakfast food does not have to be eaten all at once, but can be spread within the 1 – 3 hours after waking. 4. 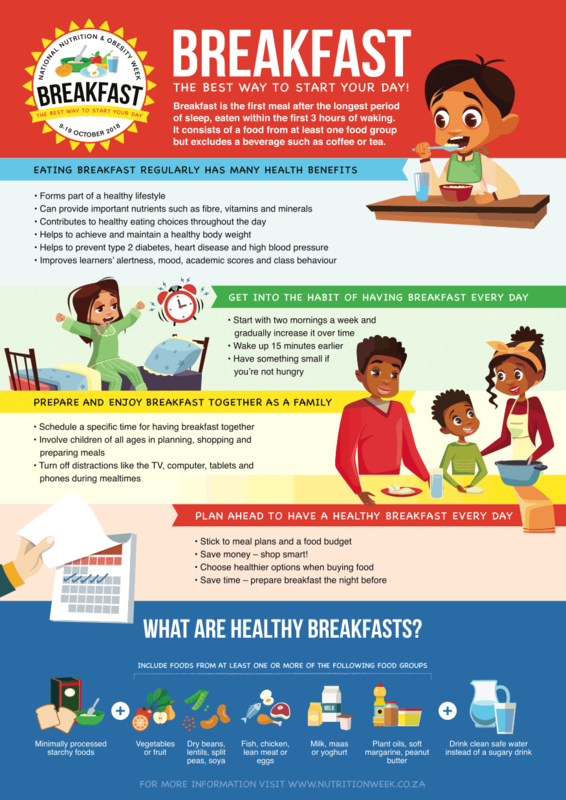 Why is it so important to eat breakfast? And improves learners’ alertness, mood, academic scores and class behaviour. 5. From what age can a baby start eating breakfast? Babies should be given breastmilk only for the first six months of life. Breast milk contains all the energy, vitamins and other nutrients in the correct amounts and water that the baby needs. From the age of six months, complementary foods should be introduced and breastfeeding continued until the child is at least two years old. Start with 1 to 2 teaspoons of soft foods (mashed or sieved) 2 times per day. Increase to up to ¼ to ½ cup per meal by 12 months, given as 5 small meals by then. One of these meals therefore could be breakfast that is eaten together with the family. 6. What ideas do you have for interesting and healthy breakfasts? If you are in a real hurry, grab something to have on-the-go or at work, for instance a fruit and unsweetened low-fat yoghurt. Peel and chop fruit such as apples, mangoes and pineapples in slices. Freeze in ziplock bags and use in smoothies. Blend uncooked oats with some unsweetened low-fat yoghurt. Add a few nuts. Try to avoid refined, sweetened breakfast cereals, too much sugar from jams or table sugar, salt added to meals or unhealthy fats like butter, hard margarine or fat from bacon. Rather add fresh or dried fruit to breakfasts like oats, which add a natural sweetness, or use spices like cinnamon to add another interesting flavour.